The club provides these awards to in excess of 40 Primary and Secondary Schools in the local area. Nominations are made by each school of a student who has been a good "citizen" of the school. Each recipient is given a certificate and a pen, a presentation is also made to the school in the students Name. This award winning program was run by the LIverpool PCYC and was funded by the club. It took Aboriginal youths and as well as teaching them how to box and surf had a recognised local Aboriginal Artist teach them how to traditionally decorate a didgeridoo which they kept. A didgeridoo was also decortated and presented to the Club in appreciation and it is displayed in the Restaurant at Liverpool Catholic Club. Our Club is proud to provide ongoing financial support for the Local Police Area Command YouthCamp. This annual youth camp organised by the Liverpool Local Area Police Command takes local teenagers who have come to the notice of the command on a weekend camp. The police officers volunteer their time to work with these kids and have had great success in building ongoing relationships. This camp has proved its worth year after year with a virtual zero re-offend instance. The motto of RYPEN is the cultivation of youth. The quality of our future depends on the quality of our youth. The Rotary Youth Leadership Award (RYLA) is a challenging one week program which provides an unique opportunity for leadership skills and personal development. 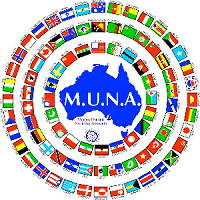 MUNA simulates the workings of the United Nations Assembly by having teams of two or three senior students represent a particular U.N. country in debates on matters of world political and social concern.